I’m getting close to wrapping up our series of rye write-ups so we can put together a Guide to Rye, similar to our Stogie Guys A-Z Guide to Bourbon. This new Willett Family Estate Small Batch Rye is one I definitely wanted to include. Willett has been bottling good rye for a while now, but up until a few years ago they didn’t distill any of it (at least since the 1970s). Companies, especially new ones, that bottle and brand whiskey made elsewhere are a dime a dozen (and that’s not a knock as some of it is quite good). Though Willett isn’t a new name in the whiskey game. On the bourbon side, Willett has a history of aging and bottling excellent bourbon, including Noah’s Mill, Pure Kentucky, Johnny Drum, and a series of very small, very old, limited bourbons under the Willett name. For rye, they’ve been doing similar things with super limited, old ryes along with a barrel-proof four-year-old rye distilled from the 95% rye mashbill at the Indiana-based MGPI distillery (with a few things in between), all under the Willett name. In other words, Willett knows how to find good whiskey distilled by others. What sets this Willet Family Estate Rye apart is it’s the first Willett product to be released that was distilled by Willett. Given that the company has only been distilling for a little over two years, the Willet Family Estate Rye features an age statement of just two years. Like the four year Willett rye distilled in Indiana, it’s barrel-proof (my bottle was 108.1-proof). The rye pours a nice golden color, although the nose is slightly less inviting with a combination of nail polish with more pleasant butterscotch and orange peel. On the palate it shows a nice combination of toffee, mint, and citrus. It has surprisingly little spice and a decent amount of alcohol burn, but there’s also a syrupy intensity to its flavors. The finish is long with burnt orange and floral sweetness. 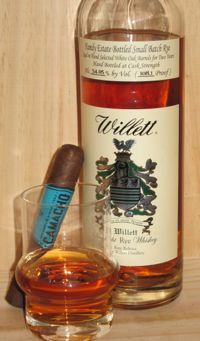 I tried to find a particular style of cigar that best complements the Willett Family Estate Rye, but ultimately I think any good cigar that’s medium- or full-bodied is going to work. Barrel-proof rye isn’t everyone’s cup of tea, even if you are a fan of other ryes. But this is really quite good, especially at $35-45 a bottle. Mostly, though, it makes me look forward to seeing what comes next from Willett’s stills. If this is what their rye tastes like at two years, I can’t wait until it gets a few more years in the barrel. So while big rye fans shouldn’t hesitate to scoop up a bottle, if you’re more of a dabbler in rye just wait until this gets even better in a few years.